Summary: Oliver attempts to make a Christmas gift for Clark. Author's Notes: for the smallearth advent calendar, prompt: wool; thanks to my beta, boltgirl426, for all her help! Finding the perfect gift was always difficult. It was even harder when shopping for one Clark Kent. Oliver Queen was experiencing that first hand. For a long time, Oliver didn’t have anyone to shop for, so while most people hated Christmas shopping, he was actually grateful to have finally have people in his life for whom he could buy gifts. He was almost done- he had gotten gifts for the Bart, AC, Victor, Dinah, Chloe and Lois … the only person left was the most important. Ollie had been banging his head over figuring out a gift for Clark for weeks and came up with nothing. It was terrible; this was the man he loved … he should know Clark better than anyone, yet he couldn’t even think of a good gift. In his defense, Clark wasn’t much help. Every time Oliver asked him what he wanted, Clark just smiled and said, “I don’t want or need anything.” Sure, people said they didn’t want anything but Clark actually meant it. So what the hell was Oliver supposed to do? Finally, he went to his last resort: Chloe. She had known Clark the longest and might have some insight. Just as he hoped, she did. That’s how Oliver ended up attempting to make Clark’s gift. For all his talents, he wasn’t very creative. A quick Google search provided him with many ideas, but one in particular caught his eyes: knitting. Ollie could knit Clark a sweater! He had always been smart and easily picked up new things, whether that archery or even learning to hack. How hard could this be? Those were famous last words, or at least that is what Oliver realized as he poked himself for what felt like the millionth time. “Ouch!” He winced, dropping the needles. Staring at his abused fingers, he sighed. This was getting ridiculous. Maybe a sweater was a bit ambitious. I should change it … maybe a scarf instead? Glancing at the wool, he realized a scarf was possible … a sweater? Not really. One thing was for certain: he needed a back-up gift. With a week left till Christmas, the crowds were going to be terrible, but he had no other choice. So he made it to the mall, spent about twenty minutes just looking for parking, and that was the easy part. Getting inside, he found every inch of the mall packed, people pushing and pulling to get by, and he inwardly groaned. Clark’s worth it. That was understatement. The trip wasn’t a complete disaster; he found some gifts, including but not limited to a few books that Clark had mentioned, and a gorgeous cashmere sweater that matched Clark’s eyes. If he couldn’t make it, at least he could buy it. Those were all ordinary, at least to him. What he wanted was that one special gift and he couldn’t find it. Exiting another store, disappointed, a familiar figure caught Oliver’s eye. Could that be …? The woman in question turned around and smiled, upon seeing him. It was indeed Martha Kent. She made her way toward him. “Hi, Oliver,” she greeted him. “Something tells me that person is my son,” Martha remarked. “Are you psychic?” Oliver wondered aloud. Clark had often claimed his mother possessed the ability to read minds, but now he hadn’t believed him, until now. “Yeah, and it was no help,” Oliver said, cringing. “What did you do?” Oliver couldn’t help but ask. “Then I would definitely appreciate it,” Oliver said, grateful. “Thank you, Martha,” Oliver said. They both knew what he was thanking her for, and it wasn’t the offer to help with the knitting. Ollie was confident in Clark’s love, and he knew that Clark was happy with him, yet hearing Martha say those words filled his heart with joy. He liked to get confirmation that he did make Clark happy, especially from the woman who knew him best. Ollie hadn’t had much luck as far as relationships went and he knew Clark was “the one” so he really was giving it his all. And I always will, he silently vowed. Then, all of a sudden, it was like a light bulb went off. Martha could help him with the scarf, but he had a perfect addition. The rest of the week went smoothly. With Martha’s assistance, he managed to finish the scarf, which actually looked pretty good, if he said so himself. Fortunately, Clark didn’t even suspect anything, too busy with the Planet and stopping crime. Crime only increased during the holidays and both Green Arrow and Superman were kept busy. However, Christmas Eve was just for them. They were going to have dinner at the farm, but first, Clark and Ollie were just enjoying spending time together at Ollie’s penthouse. “I was thinking,” Clark murmured, as they cuddled near the fireplace. “Thinking what?” Oliver asked, snuggling closer. Yes, this was perfection. Clark stood up, causing Oliver to frown, opening his mouth to protest this action, but his boyfriend spoke before he could say anything. “Well, we’re leaving to the farm soon, but I wanted to give you something first,” Clark said. He disappeared and reappeared moments later, with a box in his hand. Surprisingly, it had holes in. “I thought the tradition is to open one gift after dinner,” Oliver said, puzzled. “Merry Christmas, Ollie,” Clark replied, handing over the gift he had for him. Ollie was surprised to feel movement. “Open yours first,” Clark added. “Sure,” Oliver said. Carefully, he unwrapped it, unsure what to expect. When he pulled open the box, he was shocked. Inside, fast asleep, was a tiny kitten. As if sensing them, the kitten awoke, opening its eyes, looking up at Ollie. It was orange with bright green eyes and Ollie just fell in love. Pulling the kitten out, he grinned when it purred. Placing it on the floor, he couldn’t help but smile as it ran around. “Now it’s your turn,” Oliver said. “Open the scarf,” Ollie urged. Tilting his head at Ollie’s words, Clark paused for a moment, but did as he said, revealing a tiny box there. Snapping it open, he gasped when he saw what was inside, a white gold ring, with a large diamond in the center, tiny diamonds and emeralds surrounding it. Meeting Oliver’s gaze, he found that the blond was a lot closer than before. Taking a deep breath, Oliver took Clark’s hands in his own. For a full minute, Clark didn’t speak, his gaze darting from Ollie to the ring and back. “Clark?” Oliver said, his stomach tightening at the lack of response. Ollie’s smile matched Clark’s as he whopped in joy. Cupping Clark’s face in his hands, he captured his lips. They only separated once the need for air became overwhelming. “I love you,” Clark said softly. “I love you too,” Oliver replied immediately. A mew had them turning and Ollie outright laughed. Apparently, the kitten had found a ball of yarn, and was trying to conquer it. “It seems that he’s having about as much luck with that thing as I did,” Oliver commented. Ollie just smiled, and leaned forward to kiss the lips of his boy-no, fiancé. As far as Ollie was concerned, the only thing he needed to be good at was loving Clark the way he deserved. Everything else was just icing on the cake. I didn't know what to do at first and then it just came to me. I had to throw in the kitten because it was just so cute. Yes! that's very true. I'm sure the kitten will keep them busy and yet be spoiled rotten. This is commented on with love! ahhhhhhhhhhhhh love it! how sweet omfg <3<3 I love the little kitty and Ollie and Martha and Clark!!! I'm glad you liked it and everything worked for you. 'Sweet' was what I was going for. I saw the picture prompt and while initially I was going to just sick to the wool part, the kitten was so cute that I had to throw in it there too. Aww, I'm all gooey. This was just wonderful. And the picture of the little kitten is so gorgeous. I would love to have someone as thoughtful as Ollie. What a lovely story. Aww, I'm all gooey. This was just wonderful. That was the reaction I was going for! I am glad you enjoyed it. And the picture of the little kitten is so gorgeous. Isn't it? That was the prompt picture I got when I signed up for the advent calendar. Initially, I was going to just stick to the wool prompt but the kitten in the pic was so cute that I had to add it in. I would love to have someone as thoughtful as Ollie. What a lovely story. Yup, they all found their way in the story! The kitten was in the prompt pic I got, and while I was going to stick with just the wool prompt, it was too cute not to include. As for the proposal, I hadn't planned on it but it just headed in that direction so I went with it. Glad everything worked for you! I love holiday cuteness, and I really like that Oliver didn't throw money at his problem. I love holiday fics too, both reading and writing them. I can imagine Ollie is the type to actually spend time and effort, and not just throw money at gifts, especially when it comes to the people he loves. I took a sewing class and there, I learned to knit a bit and even knitted a headband. But that was in elementary school. Yes, it was very painful for Ollie. What he does for love! I am happy to hear that my Ollie works for you. I like to make him sweet and loving, especially toward Clark. The kitten was in the prompt picture I got. 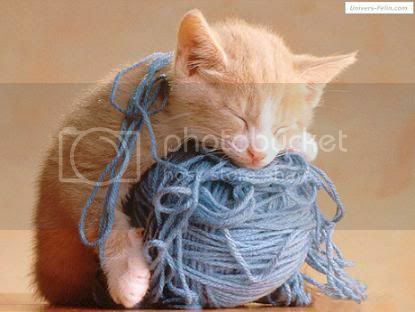 Initially I was just going to stick with the wool prompt but the kitten was just too cute not to include. So much love for this. Just what I needed to read to britghten up my day with all the crap that has been going on. I like having her in fics. She's an awesome mom and I have fun having her and Ollie bond. Damn it, where have I been? I can't believe I missed this ! It's absolutely amazing, I'm so glad you wrote Martha in this, I miss her! I'm glad you liked it! And I hadn't initially planned to throw in Martha but she fit. I am happy to hear that it worked for you. I do love her and miss her at times. He is, isn't he? And yay! 'Warm and fuzzy' was what I was going for. Thank you for reading and taking the time to leave such a sweet comment.